Earlier topic: Adana 5x3 - how to check age with serial numbers? Can anyone identify this font? Thank you. Also could be San Serif which was the ATF copy of Kabel. Very similar to Kabel, but I think not Kabel. The cap U in Kabel has a short vertical on the right just like the l.c. u. The typeface shown above is Kabel Bold (Germany). 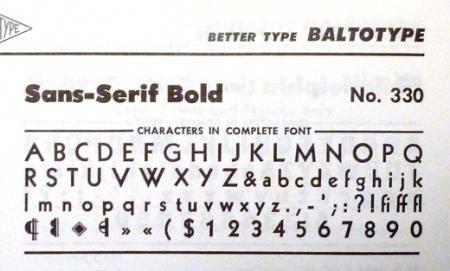 If it is a Monotype casting, it is likely to be an incomplete showing of Baltimore’s Sans Serif Bold (No. 330). As Inky noted, the German Kabel has a cap-U stem. While it is true that the cap “U” of Kabel has a stem on its right side, the cap “U” of Kabel Bold does not. This is true for both the foundry type version as well as Monotype (Baltimore) Sans Serif Bold No. 330. 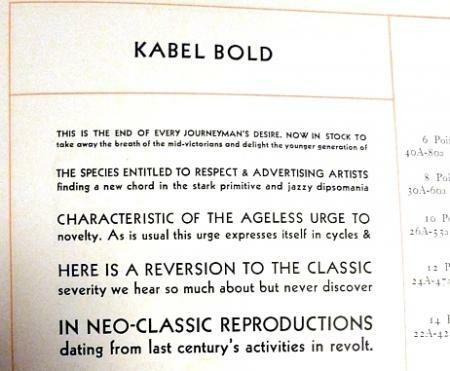 Photo from the 1929 Continental Types specimen book shows the German foundry type Kabel Bold. Second photo from the Baltimore Type Catalog showing Monotype Sans Serif Bold. The typeface in question is either Kabel Bold foundry type or Sans Serif Bold Monotype.